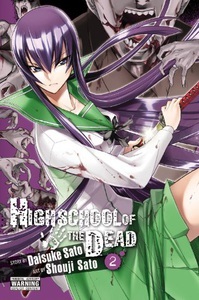 Separated from the rest of the survivors from their high school, Takashi and Rei make their way through town, taking in the full scope of the sudden outbreak that's turned most of the residents into undead terrors. Though the immediate threat of attack has subsided, their survival instinct is still on high alert. Among those untouched by the disease, anarchy is the only law, and when anything goes, Takashi and Rei may have to become monsters themselves if they want to stay alive.